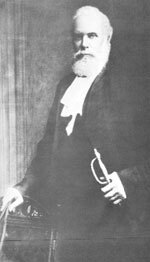 Dubbed the Hanging Judge, Sir Matthew Baillie Begbie has emerged as one of the two or three personalities from the post-exploration period of 19th century British Columbia that British Columbians can name--the others being James Douglas and Amor de Cosmos. Although his birth has been recorded at Cape of Good Hope on May 9, 1819, Begbie was born either en route to the Indian Ocean or on the island of Mauritius where his father had been posted. He grew up on the Isle of Guernsey and studied mathematics and the classics at St. Peter's College, Cambridge. The son of a colonel in the Royal Engineers, he received an M.A. from Cambridge in 1844 and began working as a impoverished lawyer in London after travelling in Europe. Possibly due to disappointment in a love affair--he never would marry--Begbie immigrated to the new mainland colony of British Columbia in 1858 to serve as 'Judge in Our Colony of British Columbia'. Appointed in September, he arrived in November and soon became a commanding presence with his six-foot-four frame, his Van Dyke beard, his stylish black hat, his long cloak and his sometimes diffident manner. He never wore the robes of an English judge. Begbie lived in New Westminster from 1860 to 1870, then moved to live permanently in Victoria where he was known as a patron of the arts. He was a sociable man who spoke French and Italian, having visited Italy, and he particularly enjoyed music. He entertained a great deal at his home which had three grass tennis courts and a croquet pitch. He remained Chief Justice of mainland British Columbia after its union with Vancouver Island in 1866, then was promoted to serve as Chief Justice of all British Columbia in 1870. Knighted in 1875, he retained his position until his death on June 11, 1894 in Victoria. His Naval station courtroom has been replicated at the British Columbia Maritime Museum. In the course of travelling extensively around the province as a circuit judge, Begbie had the task of ensuring respect for the law during a period when get-rich-quick riff-raff were pouring into British Columbia, chiefly from the United States. He did so by his firmness and the power of his personality. He approved of flogging. "My idea is that if a man insists on behaving like a brute, after a fair warning, & won't quit the Colony, treat him like a brute & flog him," he wrote. He is credited with warning some riotous gold miners at Wild Horse Creek, "Boys, if there is any shooting at Kootenay, there will be hanging at Kootenay." Hence he gained a deserved reputation for severity. When once challenged by an American in Salt Lake City about this reputation, Begbie answered, "Excuse me, my friend, I never hanged any man. I simply swore in good American citizens, like yourself, as jurymen, and it was you that hanged your fellow-countrymen." Remarkably, Begbie and Irish-born chief of police Chartres Brew maintained order among the itinerant fortune hunters, many of whom were anti-British. Begbie is often credited with establishing law and order in British Columbia, of "taming the west," but clearly he benefited from the preceding administration of the Hudson's Bay Company. During his first tour of the Fraser Valley gold fields, he wrote to James Douglas on April 25, 1859: "It appeared that there was on all sides a submission to authority, a recognition of the right, which, looking to the mixed nature of the population, and the very large predominance of the Californian element, I confess I had not expected to meet." Frequently generous and whimsical in private, Begbie was known for his bracing and grim humour during trials, some of which were held in makeshift courtrooms in saloons and hotels during his early travels. Once when he didn't agree with a jury's verdict of non-guilty, he admonished the defendent. "The jurymen say you are not guilty, but with that I do not agree. It is now my duty to set you free, and I warn you not to pursue your evils ways, but if you ever again should be so inclined, I hope you select your victim from the men who have acquitted you." Mount Begbie, southwest of Revelstoke, is named in his honour. A Frontier Judge: British Justice in the Earliest Days of Farthest West (Toronto: Rous & Mann Limited, 1938), by Selwyn Banwell. The Man for a New Country: Sir Matthew Baillie Begbie (Gray Publishing, 1977), by David Ricardo Williams. Matthew Baillie Begbie (Fitzhenry & Whiteside, 1980), by David Ricardo Williams.